We have a new scenario to an old problem in our home. Old problem = fear of something that always hits at bedtime. New scenario = It is Elisha’s turn. My sweet little 5 year old has a new fear. Is it the dark? Nope. Is is scary monsters? Nope. Is it burglars? Nope. Is it a fear that the house might catch on fire? Nope. If it were any of these, it wouldn’t be a new scenario because we have already been through these bedtime fears! Every night right after he went to bed, he would come to us crying that he was scared. Now I am all over bed time manipulation but this boy was scared! He would shake all over. He would turn white as a ghost. He would cry in his sleep. Pure terror. I don’t know why the fear is so real in his little heart, but it is there! One night we shared how it wasn’t even raining so it was okay. One night we talked to him about how far we were from any rivers or lakes and we were fine. One night we shared with him how dams and floods worked and that the town in the book was built right under a dam that wasn’t safe but we didn’t live in a town like that. He would say okay and calm down and next night he would be right back to us. I knew at that point that his fears were bigger than Mommy and Daddy could handle and he needed Someone bigger than Mommy and Daddy. We have a song in our family that I have sang to my children since they have been tiny. It is based on Psalms 56:3 – “What time I am afraid, I will trust in thee.” The next night when he came out, I told him that sometimes no one can help you with your fears except Jesus and that Jesus is always with us….even when we are afraid. He crawled up into my lap and laid his head on my shoulder. I felt his hot tears against my cheek as I begin to sing to him. I felt his body calm down as we sang. When we were done singing, I prayed with him and asked Jesus to please lay beside him and snuggle him and help him to know that he is safe and loved. He hugged me and kissed me and ran off to bed. Every night we have a new routine. Hugs, kisses, bedtime prayers, song, more prayer….bedtime. Music is very calming to our little ones. Music is very calming to me! God’s Word is very calming. When you can put the truth of God’s to music, you have a powerful bedtime help! Now, Elisha sings with me word for word. So far, we have had no floods. 🙂 I know that my son will outgrow his fear of floods as all of my children have their unrealistic fears. My prayer as a mother is that my children never outgrow the comfort of God’s Word and talking to Jesus who loves them more than I ever could. Here is a link to the song I have always sung to my children when they are afraid. True confession: there have been many bedtimes when I have been afraid about real life and I have sung this song to myself. Enjoy! 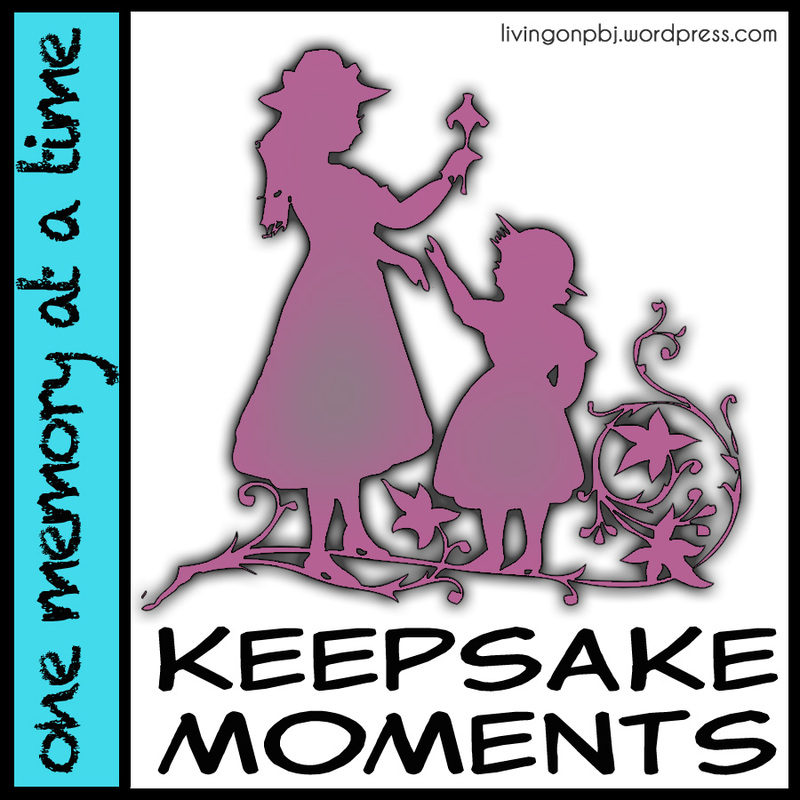 Categories: Alicia, being mom, quiet time, relaxing, training | Permalink. Ever feel it? 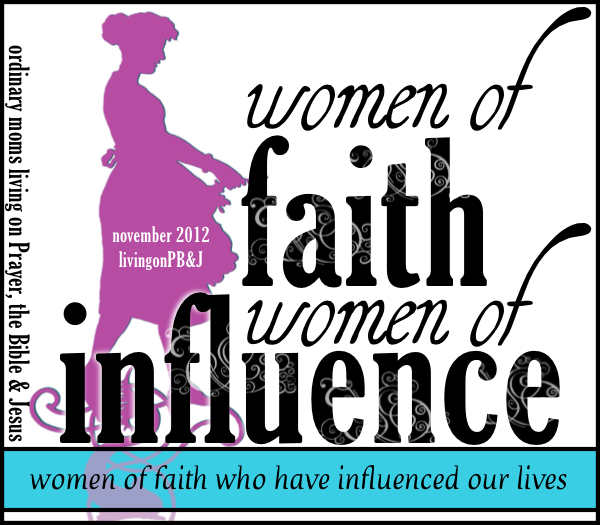 This guilt that comes along with being a wife, a mother and a Christian? Blogs, Pinterest and Facebook do not help either. You read a blog of someone describing how to teach your children to pray and you feel guilty that you haven’t done that yet. You see a beautifully organized home on Pinterest and you feel guilty yours isn’t like that. You see a Facebook post from a friend that shares their Norman Rockwell day and you feel like such a failure! Am I alone in this or do you all ever feel it? We talk about the pressure that society puts on us as women, but I would like to say that most of the pressure we feel in our day-to-day lives are what we put right on ourselves. Maybe technology has brought all of us so much closer together (and I love that!) but it also leads us to much “comparing of ourselves” – which is not okay! I believe the warning of that passage in Scripture is to keep us away from much guilt. This has been SUCH a comfort to me! It has ended a lot of guilt because I know how to identify what is from God or not. If it is not from the Lord, it is out the door of my mind in seconds! I will not give him access there! 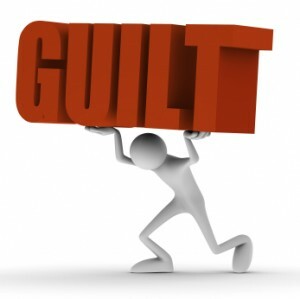 Guilt that was never given to me by the Lord to carry. God doesn’t want us to feel guilty about everything. That is a very defeated way to live. What He wants is for us to keep an ear open for His soft voice that whispers guidance in our lives – not screams accusations. So….enjoy your day my sweet friends. Guilt free! Categories: Alicia, being friend, life lessons | Permalink. I cut my finger. With my little boy’s knife. Yes, he has never cut his finger and his mother tried it for the first time and cut her finger. He actually apologized to me for me cutting my finger with his knife. Adorable. Since I was so immature in cutting my finger, I have been wearing a Spider-man band-aid. They belong to my 3-year-old and I have one on. It isn’t because I don’t have any other band-aids. I do. It’s just that they were in the glove compartment of my van (don’t ask) and the Spider-man band-aid was easier to get to. Today, as I was scraping paint drips off my wood floor, I looked down at that band-aid. My finger doesn’t bleed anymore and I could really go without a band-aid. But, I was worried about the cleaner getting in so I wanted to protect it. So, I left it on. 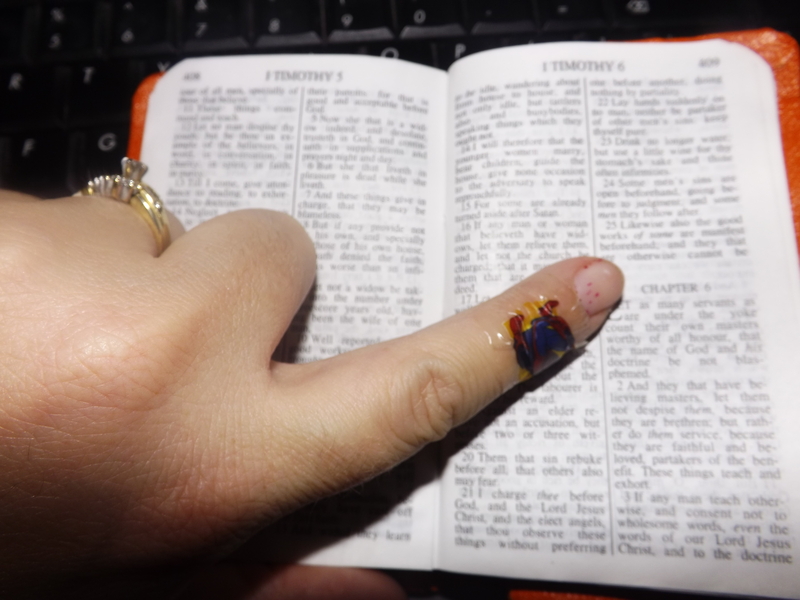 And, like my weird mind does, I started thinking about that band-aid and….Bibles. Yes, my Bible. Do you know that I have never had a Spider-man band-aid on my finger before? Course, I don’t cut my finger with a knife every day either. I wonder how many times we get hurt and we grab our Bibles to stop the bleeding. I wonder how many times we carry our Bible around as a novelty – something to just kind of flash around and impress someone. Spider-man band-aids are pretty impressive….to immature children at least. I wonder how many times we look at our Bibles as a kind of “covering” that will protect us from the harshness of this world. I wonder how many times I look at that Bible on my shelf, and feel so smug and confident that I know it is there to comfort me when I need it, to go with me when I am out, and to use it at the appropriate times. In reality, I wonder how often it stays in those places and I do not even consume and digest what it says. Is it bad to use our Bibles as a band-aid? Not necessarily….unless of course you use it as an object instead of something that is alive. Do you know what brings healing to my cut finger? It is the live cells in my body that are working night and day to heal this wound. It is not the band-aid. The band-aid is just something that you see. Our Bibles, whether they are genuine leather, Thompson Chains, red-letter editions, black, red, pink or camouflage, are not what matters. It is the Word of God. The living breathing Word of God that must be active daily in our lives that will heal our sinful souls, purge us of sin, and guide our every step. I am glad that my Bible is not just a “book”. I am glad that it is not a good luck charm. I am glad that even though the cover may get old and the pages fall apart, the Word of God is fresh and new to feed my soul. It is not how many words on a page I read. It is how much I allow those words to change my life and guide my day. As we start this New Year, I want to remember to keep the Word of God daily active in my life….and not just use it as a band-aid. I want a healed finger. Not a flashy one. Will you join me?